proclaimed Yahoo Finance headlines last week. Though flipping houses is on the rebound, there are pros and cons to flipping a house and it's not a job fit for everyone or every market. We are in the business of assessing every project on a case by case basis. We start by taking a birds eye view of all the outlying factors involved in a project to make sure the interior design services we provide are in the best interest of our clients in the long run. Today we're looking at a home that followed a different path than the buyers originally intended. Our clients were not looking for an investment property, instead, they were interested in finding a home for their retirement years. The process of evaluating and comparing what they wanted in a home with the house they purchased was an important and also delicate matter. How did we come to make a decision to flip this house and turn it into an investment property instead of their future home? Here's the scoop. First off, I am not a realtor. I always tell my clients to have a conversation with their realtor about what would be in their best interest from the perspective of the housing market, what neighborhoods to explore, and what concerns to look out for. In this case, the homeowners worked with their realtor and found an ideal home that with a complete renovation would meet the needs and wants they were looking for. However, when I back up and recall our early meetings and conversations, there were several moments that pointed to this switch from a) renovating the home for retirement, to b) flipping the home and selling it as an investment. If I retrace those moments, it's easy to see what triggered the shift. If you've ever considered flipping a home as an investment opportunity, make sure you do your homework before joining the movement. Here are four questions you must ask when deciding whether to stay or to sell? Our clients had purchased this great home to renovate, downsize and retire in, but it didn't seem like the right place for them. #1. Is this the setting you see yourself enjoying most long term? 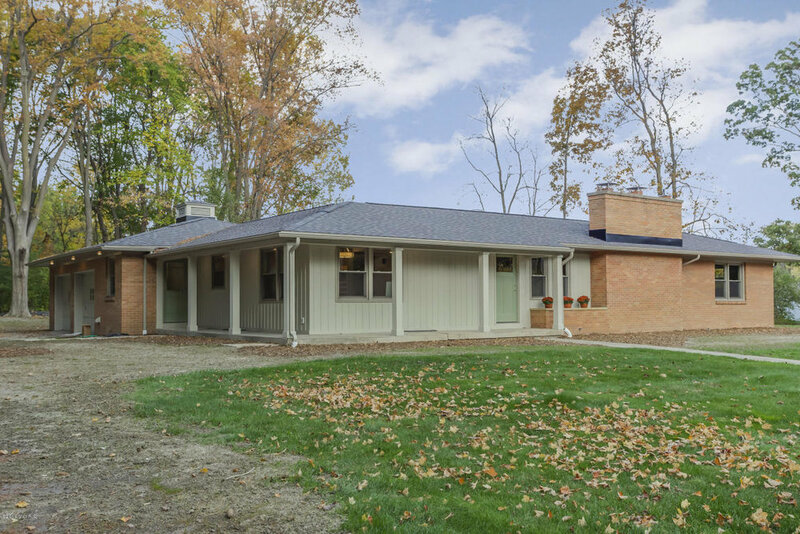 Our clients were moving away from a spectacular property in East Grand Rapids. As we met in their existing home and visited the house they just purchased I realized that they weren't just downsizing. With this new-to-them home, as nice as it was, they were losing more than size. They were losing privacy and an absolutely gorgeous setting and I suspected they would miss it. They were coming from a setting where the view out the back made it seem like there were no neighbors, it felt exclusive, and they had a manicured yard that surrounded a beautiful pool. The landscape was absolutely stunning and I could tell that they really valued the character it brought to their current home. The new home by comparison, even though it sat on one of three lots making it feel somewhat more private than its neighboring properties, still didn't offer the more secluded feel and striking view they were used to and enjoyed. Finding a place to call home is more than just finding a great location, it's also about backdrop and how the property makes you feel. What are the mood and the atmosphere of the property's surroundings. When you find a backdrop you love, do some research to make sure it's protected from being disrupted due to potential development. Take a big picture look with a long view to find a place where you will love living! While this yard had potential and the neighborhood was great, it paled in comparison to what they had at their home in East Grand Rapids. This was the first tip that it might be worth selling and looking for another home in a setting that they would really love. #2 Does the home work for you AND does it bring you joy? On paper, this home made perfect sense for the buyers. It was a smaller home, one level, with great bones and loads of potential with renovation. It was affordable and in a nice neighborhood. It was simply an all-around great house and location and it seemed to fit their retirement goals. Yet, I just didn't think they wanted to be there. It seemed too small for them. The yard and view simply couldn't compare to the one they were leaving and loved. It was a gut feeling based on the signals I was getting from our clients, that although it was a reasonable choice for them, it wasn't a choice made from the heart. #3 Do you have more than one way to achieve your goals? Our client had options. I wasn't talking them into a decision, and I wouldn't have suggested selling if they had limited options. It knew it could be in their interest; they had time, and we knew that it wouldn't be a financial risk. If you have time and financial viability to find a home that will fit you better than where you are, don't be afraid to broaden your search. One massive benefit for our clients was that the property sat on three lots and the house only sat on one. With the other two lots available for building new homes, that was a huge bonus in favor of the option to sell. They had the choice to sell the house and separately sell the adjacent lots during a market climate with record-high demand. #4 Can you see yourself here year round? In a climate like Michigan's where the seasons dramatically change the landscape of a home, it can be hard to envision every season during the home buying process. Buying in the warmer season, you might miss what the view is like when the trees are bare. Buying in the colder months, you may not see the promise of greener days. Yeah, we see what you’re talking about it. We love what we had. We don’t want to live in the house we bought; we want to keep looking for our perfect retirement home. I could have been wrong, they may have really wanted to stay. Yet, from what I observed, it only seemed fair to show them another perspective. I didn't try to talk them into anything. I simply stated the idea. There was no pressure. I asked them to think about it and talk about it together. I just wanted them to think about all their options, because they had options. It took them a little while to consider and I was okay with whatever they decided. I let it go and let them figure it out. Do your best to think year-round, regardless of what season you're moving or selling in. A change of perspective might shift your decision in your choice of home. With Forbes.com calling Grand Rapids the #1 market to watch in 2016 and still sitting at #4 for 2017, our clients worked with us to renovate the house they had purchased and sold it for $50k more than they had expected it would list for. It was on the market for less than a week before they began receiving offers. Last we checked, they sold one of the adjacent lots. Altogether they've earned a net of $150k after purchase, renovations, and interior design expenses. That investment money gives them even more options and time to find a place that will give them a retirement home that they'll truly love and feel settled in. We renovated this home with the intent of selling. A complete renovation offered potential buyers a clean start with room to personalize.